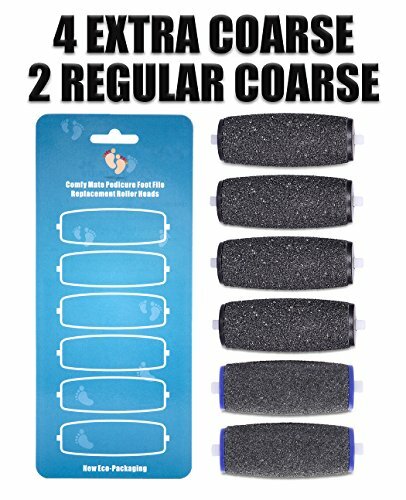 THE MOST THOUGHTFUL AND VALUABLE 6 PACK - 4 Extra Coarse for removing thicker cuticle more effectively and quickly, 2 Regular Coarse for daily maintenance; Retrieve your beautiful feet in no time. CUSTOMIZED FITTING - Redesigned washable outfit to perfectly fit Amope Electronic Pedicure Foot File and many other brands; With this curved design,the rollers can fit your skin surface perfectly. TOP GRADE MATERIALS - 2 times more hard micro-diamond crystals abrasive particles compare to other brands, make it removing dead skin more efficiently, and ultra durable than ever. TOP QUALITY ENSURED - Not only the price is the best, but the quality is still the best in the market. Disclaimer :The Comfy Mate replacement rollers are in no way connected or affiliated to the trade marked manufacturing companies Scholl, Dr.Scholl,Pedi Perfect and Amopé.